Lard, or pig fat, is actually not that bad and can be a real food and a part of a real food diet. 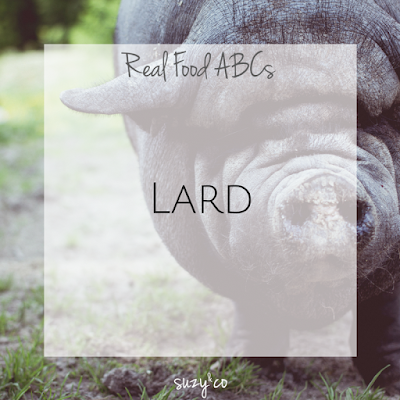 By now I don't think it will surprise many people that I have lard as part of the real food abc series. I have already promoted butter and saturated-fat laden coconut oil. The next fat I want to talk about is lard. Lard is pig fat. Any fat on the pig can give you lard, but the best fat comes from the "leaf" or the fat that surrounds the kidneys and loin. It is great to use in pastries because it can produce a nice flaky crust. You might ask why you would want to use lard over vegetable shortening. Well vegetable shortening is highly processed, many times includes trans fats, and originally was created to be used as a candle. And about the fat in Lard? Can I use any old Lard? Well, unfortunately, cheap lard will be unhealthy. You want lard from animals who raised sustainably outside To get the highest vitamin D content, the pigs need to be raised with access to the sun. Fat tends to store a lot of toxins as well. So if the pigs were treated with antibiotics and pesticide laden food, those could be stored in the lard. It is best to find humanely raised pigs. If you cannot find a good source of lard, you can make your own. Stayed tuned this week because I will be sharing lard recipes.